Preparing for your first 100 mile gran fondo can seem like a daunting task. I know that myself all too well. Been there, done that. It’s one thing to go the distance, but it’s another thing to go the distance well. Thankfully, there are plenty of ways to get yourself in gran fondo shape without having to train like a procyclist. It should come as no surprise that the first and most important tip on preparing for your first gran fondo is to get out on the road and ride. When it comes to training for a gran fondo, there is simply no substitute for the time in the saddle. But remember, not all time in the saddle is equal. There are plenty of riders who burn themselves out quickly by going to too hard, too often without any restraint. Sure, an occasional hard day is great for your training, but in general you’ll be looking for quantity of time on the bike with several rides at or above the distance of your first gran fondo. Slowly Build Up Your Capacity for Long Rides. Gradually increase your long rides by 30 minutes if you’re coping okay. Once you’re comfortable with a certain distance, you can then add a bit more intensity via a few efforts here or there. Riding excessively hard simply isn’t that important when it comes to training for an endurance cycling event. The key to your gran fondo build-up is cruising at an endurance pace during 80% of your riding time. You’ll know you’re riding in the proper endurance zone if you feel that you can maintain your pace all day long, even if sometimes you do feel drained. To do that, you’ll need to invest in a good and reliable cycling heart rate monitor and a cycling computer that allow you to store and upload all your ride activities to platforms like Strava. If you’re riding with a mate and can’t keep up a conversation, then tone the pace down until the two of you can easily converse while coasting along. Alternatively, lookout for your local bunch rides or shop rides. The other 20% of your riding time can be made up of a freestyle approach that involves high intensity training (sprints, hard climbs, going for Strava KOM’s, group rides). This will give you a bit of top-end speed in case you want to mix it up with the gran fondo’s racing group. Using only 20% of your total riding time in higher intensity zones will also give you time to fully recover from your harder days, thus mitigating fatigue and keeping your training days and weeks rolling over to the next. Here’s what some of the pro cyclists say. This is where you ride seated up a climb in a bigger gear than you normally would, with around 50–60rpm. This can be done for anything between five and 20 minutes. Make sure you give yourself plenty of recovery riding with an easier gear afterwards. I’d say that for the average cyclist who is training for an endurance event the winter is time to really improve core stability which will, in turn, improve stability on the bike and give you a stable base. For a 100-mile sportive I would start very steady. If I felt good during the ride I would lift the pace nearer the end, but I’d get to the point where I knew I would complete it first before trying too hard and blowing. Diet is an incredibly under-utilized training tool and, in a calorie-consuming sport like cycling, it can make the difference between being capable of a 50km distance or a 160km distance. A good diet plays a direct role in your gran fondo training because it is your fuel source when you’re out on the road. The better you fuel, the further you’ll go. When we say diet, however, we don’t necessarily mean that you need to lose weight. In a training context, diet simply refers to the eating habits you adopt that are specifically targeted toward achieving your sporting goals. In this case, focus on clean burning fuel sources that power your ride and help you to recover afterward. We work really hard with the riders to make sure they’re eating plenty of vegetables, fruit, fish, chicken, lean meat and carbohydrate sources. Your body easily converts carbohydrates into glucose which is what your body uses to produce energy. Carbohydrate sources such as gels, sports drinks, and dates are quickly digested and used as immediate energy whereas bread, rice, oatmeal, and pasta provide a longer-lasting energy source that takes longer to digest. Because of this, they are best eaten two to three hours before a ride in order for their them to effectively work as an energy source. Eating a varied, vegetable-heavy, and protein rich diet is essential. The vitamins and minerals to be found in a plate with a rainbow-assortment of vegetables are indispensable to your recovery, and the lean protein found in wild-caught salmon or a bowl of lentil curry with brown rice will help to recover your torn muscle fibers quickly and efficiently. Lastly and perhaps most importantly, hydrate before, during, and after your ride. Staying hydrated is so simple that it is often overlooked while other much more complicated details are not. The exact amount of water you drink doesn’t matter as much as the frequency of your hydration does. A great way to remind yourself of this point is to keep a bottle of water handy with you as you would your wallet or car keys. Stick with Food You’ve Tried Before. Try to get used to what you will be eating and drinking before and during the event and see what works. I know I can’t have really sugary sports drinks as I have an acid reflux problem and they just make me ill. Whether you’ve stocked up on water or electrolyte fluids, aim to take in at least a mouthful every ten minutes or so in order to stay at the optimal hydration levels; electrolyte drinks are a great idea as they tend to both keep thirst up and help your body retain fluid. ​​​​If you start a ride dehydrated then you are going to get into a lot of difficulty earlier in the ride than if you start fully hydrated. You are at your best and fastest when you are comfortable. This is a fact of cycling that is found anywhere from commuters on their way to work to Peter Sagan riding the 19th stage of the Tour de France. The same rule of comfort goes for your bicycle. Check-in to your local bike shop and get a proper bike fit. By doing so, you’ll know whether your bike is the right size for you and exactly where to be positioned on it. You can spend hours fiddling away at your saddle height, swapping out stem lengths, and adjusting fore and aft, cycling shoes’ cleat positioning, but there’s nothing like having a professional measure and fit you in a proper way. Consider incorporating yoga as part of your training regimen. Yoga is well know for increasing your flexibility and range of motion on the bike. 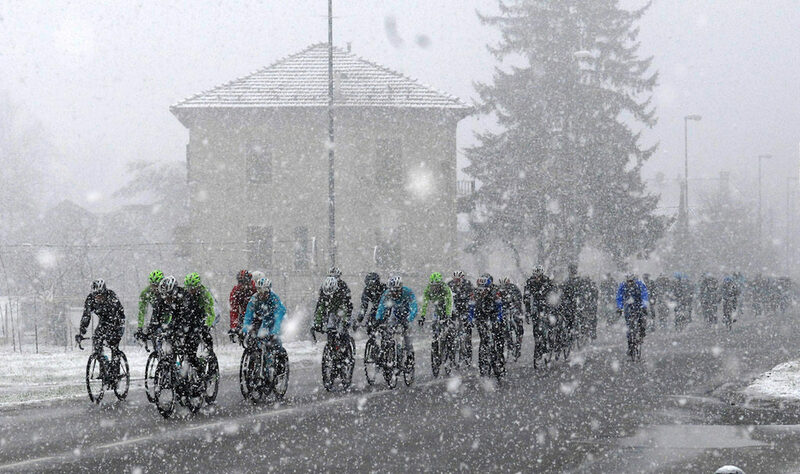 Get into the habit of planning for the weather in the lead up to your gran fondo. This way you’ll know exactly what you need and what you don’t when the big day arrives. If you’re unsure, the general rule of thumb is to err towards being overdressed. This way, you’ll still have the option to remove the unnecessary clothing. Keep this in mind when selecting cycling kit. Bibshorts with comfortable wide mesh straps and a plush chamois can be the difference between you turning home early or continuing on past the sunset. The Castelli Free Aero Race bib shorts is among the most comfortable ones today. Likewise a full-zip aerodynamic jersey with pockets that don’t sag under weight will disappear after you put it on. And that is exactly what you want. Also, your cycling kit should be the furthest thought from your mind while you train. If you find yourself constantly thinking about it, adjusting it, or just plain uncomfortable, it’s time to look elsewhere for a good piece of training kit. In the mountains, weather is highly variable and can flip your ride into a freezing, rain-soaked nightmare if you aren’t prepared for it. Checking the weather before your ride is essential, as is taking extra gear for those just in case moments that are bound to pop up. Stashing a lightweight vest or cycling rain jacket and arm warmers in an empty pocket is something of a cycling best practice in anything but the hottest days of summer. Don’t show up to your gran fondo only to be surprised by the distance, difficulty and the route itself. Many gran fondo these days provides a gpx file for the entire route. Download and load it onto mapping software like RideWithGPS or MapMyRide and meticulously study the route. This will give you an upper hand in training that will carry over to race day. By studying the route, you’ll be able to specifically target and train for prominent route features such as back-to-back climbs, technical descents, and long wind-exposed stretches of road. Also look up the climbs on Strava segments and see how much effort and time others are taking to complete them. This will give you an idea of how tough the challenge ahead is. This way, you’ll show up to the gran fondo in not only great shape, but will also be very prepared for the specific challenges of the route at hand. 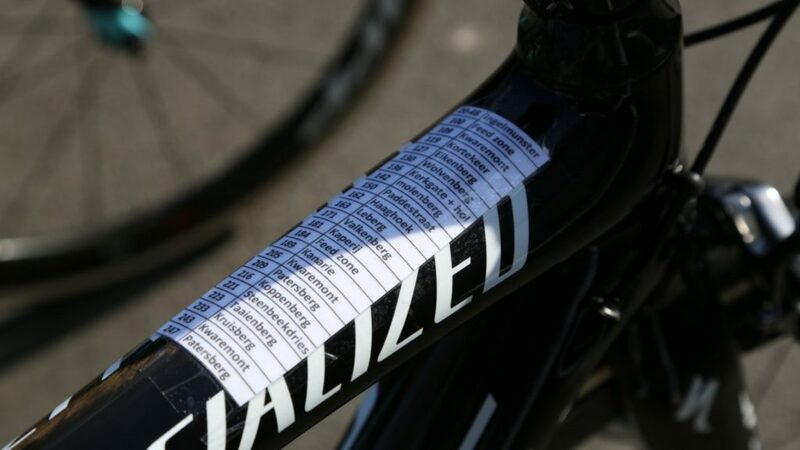 Additionally, you can create and tape a miniature route guide to your bike’s top tube or stem. 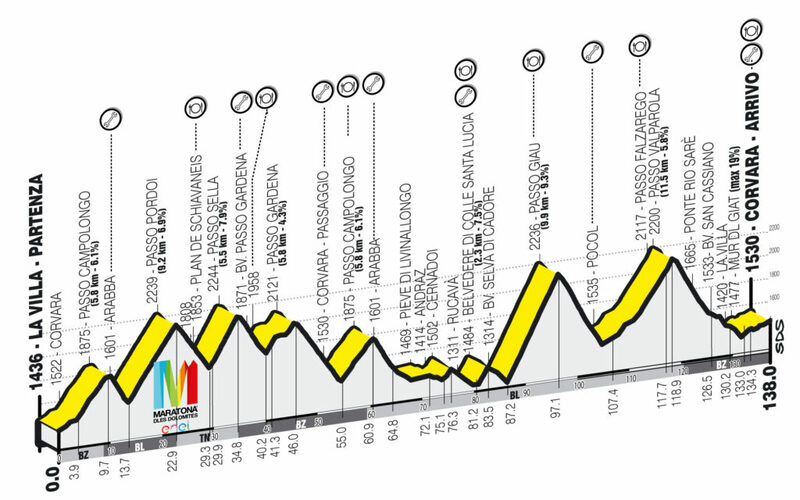 Use the guide to note pivotal points in the route with their type (categorized climb, descent, gravel, etc.) and kilometer mark. Knowing exactly when and where prominent route features are will help you to gauge how to spend your energy in segments before them. So there you go. All the best in your upcoming gran fondo!